In their many adventures, no small number of their membership was exposed to energies that have had many varied effects. Some have seen the aging processed or even halted, some were de-aged and have grown up as peers to the children of the originals. The current roster of the Legion is larger than it has ever been, with members of various ages taking up the mantle and coat-of-arms of the LSH. That, of course, is about to change. A search for survivors was nonetheless launched, with calls put out to any and all ships, outposts and planets that might encounter them. There were no confirmed reports of survivors and Dawnstar and Wildfire were listed among the lost. In response, the Legion called in every active, inactive and reserve member, and even a few recruits were fast-tracked to active duty. Three other worlds have since declared states of emergency and have deployed resources to intercept similar meteors matching the size and speed of the last.. A fourth world in the Vegan system has transmitted what they fear is the returned goddess X'hal… a female being hovering unaided in space staring at Vega and not responding to any attempts at contact. The alert signal rang through HQ, Flight Rings buzzed with a priority alert. This is not a drill. This is a priority alert to all Legionnaires with a clearance delta or higher; active, inactive and reserve. Report immediately to Legion Headquarters or the closet Science Police division. Brainiac 5's voice was never emotional, and isn't any different today. However, the choice of words hints at a great urgency. Even without the message, any holovid player that you pass is showing news of the growing panic in the UP. The news of the destruction of a planet on the outer edges of UP space has already begun to ripple through the news channels… no one has identified the planet yet, and one channel is reporting a figure floating in the Vegan system. There is some panic, but also a sense of complacency… the Science Police and the Legion will handle this, whatever it is. In Legion HQ, squads are being named off and ordered to report to various locations. Full squads are being named, even if their members are not on Earth. Those not on Earth receive a ping with further instructions for rendez-vous with the Guardian. Other squads are ordered to other vessels. Several squads are named and directed to various ships. Supergirl, Ion, Ingot, Vanguard, Lantern, Solarhawk… report to the Peacekeeper. Intrepid, Satur9, Lightning Bug, Kid Kong, Warpcore, Dragonmage and Quantum Lad… report to the Guardian. More information to be provided on route. Last edited by Bladewind on Wed Jan 25, 2017 2:03 pm, edited 3 times in total. I'm eager to get started again! Edit: and banned from being over there for the next few weeks. With thanks to Horsenhero for originally putting this together. Kid Quantum (Xanthu)- Time manipulation/stasis spheres. I didn't include those Legionnaires who have already been spoken for (Dragonmage, Mon-El & Shadow Lass, Ferro/Ferro Lad) or those that are deceased (Karate Kid 1&2, Kid Psycho, Earth-Man, Invisible Kid 1) or those Bladewind said were off limits (Brainiac 5, Dawnstar, Wildfire), but this is a pretty substantial list with a bunch of powers represented. Last edited by Bladewind on Thu Apr 12, 2018 2:37 am, edited 7 times in total. I`d like interest to reflect LSH characters or their legacies, and if a couple is established I don't really plan on letting them marry, divorce, remarry and become parents repeatedly. So… Mon-El is not the father of hybrid heroes with every female member of the Legion. These are free unless you need something "special." Brainiac 5 would need EP for his lab and its toys. Note that no matter what you put into your starships, interplanetary flight is at the speed of plot. If you are meant to intercept, you will. Skill Points at 3 ranks per Power Point spent. 1 free Social Advantage per Rank of Presence. Last edited by Bladewind on Thu Mar 22, 2018 1:18 am, edited 20 times in total. Motivation - Responsibility: Intrepid was brought up by his parents to use his abilities as a protector of the United Planets. Power Loss: Under a red sun, Intrepid loses his powers and his Strength and Stamina drop to 3. Relationships: Intrepid's parents are the veteran Legionnaires Mon-El and Shadow Lass. Weakness: Like his father, Intrepid is vulnerable to magic, his Impervious Toughness does not apply against magic attacks. Lor Gand is the son of Mon-El and Shadow Lass, and inherited just about everything from his father's side of the genetic helix. He inherited the Daxamite form, abilities, and the immunity to the traditionally toxic effects of lead by the serum his father had been given by the LSH (except the Darkforce blast where a Daxamite would normally have heat vision). That said, he received training on Talok VIII, and the aggressive culture there left with with a tad of an ego that hasn't really been removed even by Legion training or initial deployments yet. But hey, Intrepid is Intrepid, and he's done great things - even if he flirts and brags like the teenager he still is. Motivation (Responsibility)- Even if Imra wanted, there's no way she could escape the burden of her powers. So, as soon as she was old enough, she was in the Legion Academy and then it was a "rubber stamp" audition into the Legion. Relationship (Moms)- As the daughter of Salu Digby (Shrinking Violet) and Ayla Ranzz (Lightning Lass), Imra is one of the most badgered young heroes around. "Do this. Save that. Stand up for them." It's a wonder the young heroine doesn't have a permanent migraine. Temper- Much like her Uncle Garth, Imra has a problem keeping her temper in check. It doesn't take much in the way of frustration before she's tossing lightning at everything in sight. Enemy (Lords of Luck)- The mysterious entities known as the Lords of Luck tormented her Uncle Garth with their twisted games and now that he's mostly retired, they've simply moved on to the next "most entertaining" target. Imra doesn't know them, but they know her and don't hesitate to inflict misfortune on her for their amusement. Enemy (Evil Twin)- For most people this is something of a joke, but Imra's twin sister Tinya is exactly that. Identical (except for hair color...Tinya has black hair) in appearance and powers, Tinya ran off at the first opportunity and hooked up with the latest incarnation of the Legion of Super-Villains. The origin of the heroine known as Lightning Bug is pretty straight forward. Her parents, seeing Garth and Imra Ardeen-Ranzz (Lightning Lad & Saturn Girl) so happy with their sons, decided to have children too. An afternoon at the clinic and Ayla, the more maternal of the pair was "knocked up" with an embryo that combined their genetic code. Nine months later twin girls, Imra and Tinya were born. At twelve years of age, both were entered into the Legion Academy. Things took a turn for the worse, when at sixteen years of age, just shy of their graduation, Tinya rebelled and ran off. Imra had a bad temper, but Tinya had no patience for the lessons and was generally speaking a poor student. Finally fed up with the constant criticism from her parents, aunt, uncle and instructors she ran away. Imra looked for her, but was unable to find her, thus she had to attend her graduation ceremony without her beloved twin sister. From there Imra was inducted into the Legion of Super-Heroes with only the most cursory of auditions. She always suspected her mother Salu threatened to do horrible things to the active Legionnaires if they didn't let her in. On her first "rookie mission" with the Legion, Imra came face to face with her sister, now calling herself Milli-Volt in the company of the new Nemesis Kid and other members of the reconstituted LSV. They did not part as friends. Imra does her best to be a good hero, though the responsibility wears on her, but she has a family name to uphold, so she soldiers on. Damn Dirty Ape! : People have a tendency to overreact when seeing an 800 pound gorilla in their midst. Even one as friendly as ZBaku. Going Ape$hit: Though usually calm and quite cultured Kong is still a Gorilla! When angered or hurt he can revert to aggressive primate behavior. Motivation: Acceptance: ZBaku seeks redemption for his Ancestor's misdeeds and to improve human/ape relations. Mutants & Masterminds, Third Edition is ©2010-2015 Green Ronin Publishing, LLC. All rights reserved. 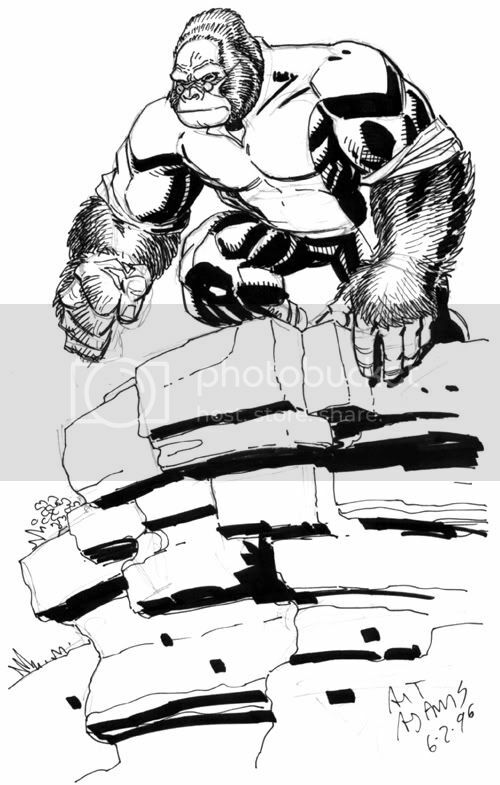 ZBaku is a young Simian from Gorilla City; a civilization in the Congo inhabited by hyper-intelligent apes. A descendant of the Great Betrayer Grodd; ZBaku has left the safety of his home to try to redeem his lineage and become a superhero. Using his budding psychic abilities inherited from his ancestor he applied to become a Legionnaire but much to his chagrin he was instead assigned to the Academy. Though extremely intelligent and educated; Kid Kong is still somewhat prone to giving in to his more primitive urges. His classmates have jokingly referred to him occasionally going "Ape$#*t" on someone. It is said ZBaku has vast psychic potential and could one day be as powerful as his Infamous Ancestor. 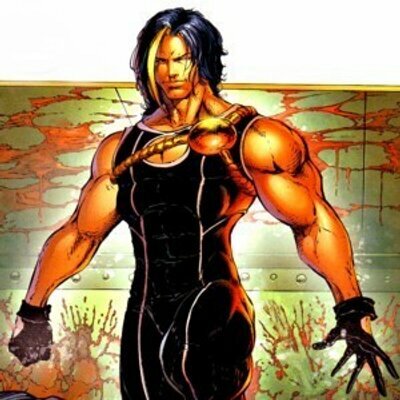 Originally from New Shanghai and trained by Master Chu Hua, he joined as part of a contingent nicknamed the Legionnaires while the Whie Witch was on Zerox. He worked closest with Monstress, Outline, Mould, Sunkiss and Catspaw, serving during the Khund Border skirmishes, Mordru Imperative and The Circle Gambit. He was once voted in as deputy leader accidentally instead of Dragonwing and hated his entire term. His final mission three years ago was the last big crisis the LSH faced and had not faced one for two years by that point. The Black Dawn Crisis began when a team was sent to aid with an evacuation due to a solar flare. The Dominion were experimenting with the sun, leading to a massive radiation surge before starting to become a black hole. Sunkiss died absorbing the radiation, whilst Mould's powers altered causing him to flee to protect his teammates. Outline went in search of him and the Dominion scientists were killed. The resulting investigation cleared Dragonmage of wrongdoing, but he took inactive status out of disgust after losing two friends due to the LSH's complacency, ripping into Cosmic Boy in the process. He joined the Legion Academy as a teacher for the past three years, teaching basic magic recognition skills and tactics. Centered and unflappable, but aggressive in combat. He is constantly calling out the LSH for complacency. Magic user - using his magic requires concentration and use of his hands. Overprotective - having lost teammates, he will be trying to protect his teammates. Last edited by Bladewind on Mon Nov 07, 2016 3:17 am, edited 1 time in total. Last edited by Bladewind on Tue Nov 08, 2016 12:15 am, edited 1 time in total. Last edited by Bladewind on Thu Nov 10, 2016 2:28 pm, edited 1 time in total. As we get going again, gonna ask that you post your sheet yourselves, and then I'll replace my post with a link to your official spot. No need to do so yet. 3rd panel: A space navy port, a legion of starships flying in every direction. Subdued auras dance across their hulls. A careful gaze will see the same colors of the angels in each aura. The heaviest looking ship has the color of the male. 4th panel: The heavy warship in the foreground, firing down upon a once beautiful planet, full of life, now shattering and breaking apart. Death. 5th panel: A hallway, a half dozen of the dark heavy shadows disintegrating, falling apart. 6th panel: A starport, a half dozen of the warships disintegrating from an attack by the heavy warship, the auras fleeing but unharmed. 7th panel: Much like the first panel, a field of flames, the angels now have their turned back to our protagonist, shunning. 10th panel: That familiar aura now presented against a Science Police cruiser. Flashbacks: The cruel deeds that his slavers did upon him and those that they forced him to do. Relationship: Shunned by his people for turning to violence he is no longer accepted among them. Mutants & Masterminds, Third Edition is ©2010-2017 Green Ronin Publishing, LLC. All rights reserved. Last edited by Spectrum on Sun Jan 15, 2017 10:59 pm, edited 1 time in total. ADVANTAGES; All-out Attack, Assessment, Attractive 2*, Benefit 2 [Legion Espionage Squad, Legion Flight Ring x2], Connected*, Defensive Attack, Fast Grab, Great Endurance, Improved Grab, Leadership*, Luck 2, Power Attack, Teamwork, Well-informed. Enemies: The Legion has a vast list of enemies, and to strike at their child would be a dark curse indeed. Relationships: Lyle has two younger siblings of which he is extremely protective, and has a loving relationship with his mother and father. Responsibility: Lyle is fully aware of the weight of the Legion legacy, taking his appointment to the Espionage League Squad seriously, hoping one day to become elected a Legion leader same as his father. Build Comments: Obviously inspired by long Legion romance of Jo Nah and Tinya Wazzo. The build is suppose to hint at the powers of both without directly copying either. Actually Thor's PC ready Vision gave me my start. You will quickly notice I have 5 points hanging out there. Honestly it could have been closer to 30 and it wouldn't have bothered me but in the end decided Lyle needed an attack while he was intangible in what is promised to be a combat heavy game. Speaking of the first name Lyle. I decided to honor fallen Legionnaires in the build, first the original Invisible Kid: Lyle Norg, who Phantom Girl would have known well from their duty on the Espionage Squad, and Quantum Kid: because Ferro Boy potentially has a legacy in play and anyone who has had three different writers kill them off needs some props. Additionally, I couldn't settle on a codename I really liked so this is close as I can get with a Legion tie-in without flatout thievery . Lyle will have the older brother classic personality traits. Over-protectiveness with traces or resentment that the younglings always are getting to do things before he ever could. 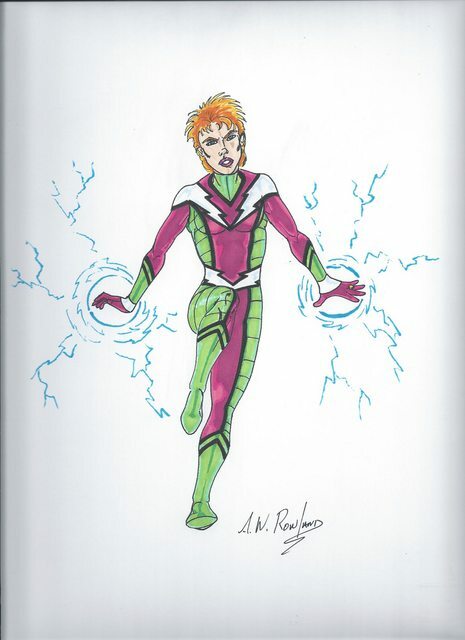 Also while they love him, the family on his mother's side are disappointed that Lyle did not inherit his mother's abilities, but can only simulate them due to the genetic machinations caused by Jo Nah time within the energy beast that gave Ultra Boy his powers. Quantum cannot see into or enter the Phantom Zone unless added by technological means. He draws and shunts his mass into and from another dimension that has yet to be discovered. Born on Earth, Lyle graduated the Legion Academy three years ago. As Quantum, he has been under the tutelage of Reep Daggle aka Chameleon Boy. Reep insist that firsthand information acquired by intelligent assets such as the Espionage Squad is as much a reason for the relative peace in modern times than any show of force by the Legion or Science Police. As much as Lyle desires to someday prove himself to his family, his father, by becoming a Team Leader, he realizes that times have changed and maybe Reep can prepare him to lead a different Legion, a Legion the universe needs for today. For centuries Superman was a beloved historical figure whose life changed the future and whose example helped shape the United Planets. When he returned two decades ago, it was like the return of the divine to many during the times of darkness ... and then he was gone. Lyle grew up inspired almost to the point of worship as a young boy by his parents stories of Superboy and the Legion of Superheroes. After the Academy graduation, he and Impulse both got tattoos of the House of El and Flash symbols ... mother was no amused, but considering the things Tinya and Jo had done at his age they couldn't come down to hard on their eldest son ... the new Legions newest inductee. 400 tons .... that's a lot of weight even for 30th century science and the intellect of Brainiac 5 .... yeah, just like Blok, the new kid needed an extra push, all it required was two of the Legion's latest model of Flight rings to keep Quantum on the move. Last edited by StarGuard on Tue Aug 29, 2017 4:17 am, edited 6 times in total. I know that Jewel, Spectrum and Starguard are here; Corrigon, EnigmaticOne, Horsenhero and Hero4Hire are on the forms... but haven`t posted to this thread yet... So that`s everyone on board. I may fire out a PM to let you all know when I start up.